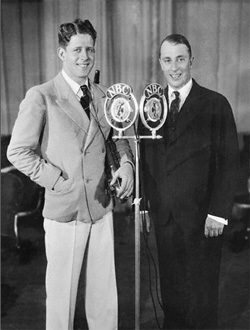 October 24th, 2009 will mark the 80th anniversary of the NBC Radio Network debut of The Fleischmann;s Yeast Radio Hour which quickly became known as the Rudy Vallee Show. While today Vallee may be best remembered as that iconic, good looking crooner with the megaphone and raccoon coat, his work on radio is what should distinguish him and earn him a place in the Radio Hall of Fame. Vallee had been a success in New York as a band leader whose popularity often led him to host several shows per night on a variety of local stations. But at 8PM on the night of October 24th, 1929, just after the ubiquitous Graham McNamee introduced him, Vallee became a national radio star. His easy-going chatter, delivered in his smooth, resonant voice must have seemed like a balm to a country that merely five days after his national debut plunged from concern to depression. As Wall Street crumbled and people were thrown out of work, Vallee was a beacon of calm and style, a reminder that music and radio could comfort a nation in crisis. For the next three years Vallee was consistently among the highest rated performers and his show never lost its top position, yet he wanted to do more and as the summer of 1932 progressed, Vallee pushed his sponsor to allow him to change the nature of his show. He suggested the format be changed to allow for more guests taken from a variety of fields. Despite some concern, Fleischmann;s agreed and on October 6th, 1932 Vallee took to the air and, now without the expected introduction by McNamee, told the audience he was giving them something entirely new; "Let;s call it variety," he explained. And so, on that night, the classic American variety show, the kind still hosted by Leno and Letterman, was born. During the next seven years Vallee brought to his microphones the who;s who of American society, culture, politics, sports, and people from every walk of life. Being on his show was a sought after invitation, but beyond that Vallee was a force and he convinced his sponsor to fund a summer series hosted by Louis Armstrong, the first regularly scheduled radio show hosted by an African American. Vallee never lost the number 1 ranking on Thursdays at 8 PM, and his corporate sponsor Standard Brands never left the show. What makes it particularly remarkable is that the network run spanned 520 consecutive weeks. Fortunately many of the later shows have survived and are gems, perfect samples of great radio hosted by the man who understood the audience and the medium as well, if not better, than anyone. Wouldn't it be nice if in this time of national discomfort there was another Rudy Vallee who could calm the nation's jitters and replace the radio of hate with radio of quality? See also Rudy Vallee Collection. Anthony Rudel has written for many magazines and is a frequent lecturer on music and broadcasting. His newest book, Hello, Everybody! The Dawn of American Radio, tells the story of the boisterous years when radio took its place in the nation's living room and forever changed American politics, journalism, and entertainment. 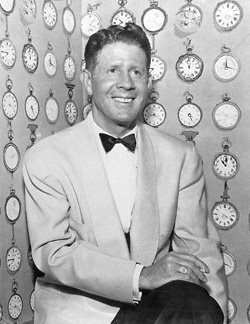 Be the first to comment on "Rudy Vallee 80th Anniversary"